Earlier this week it was announced Coors and Wavegarden will be collaborating to open North America’s first inland surf park, NLand. Today, they announced more details on their mission to put Austin, Texas on the map as a world-class surf destination. NLand is set to open in 2016, it Wavegarden’s second commercial facility after a park in Snowdania, North Wales opens this summer. They gave us the first artist’s rendering of the park itself, promising a facility the size of 9 football fields with a self-sustaining water supply. But really, everybody just wants to know what the wave will be like. Philosophical debates aside, the most practical and important detail to know is NLand CEO Doug Coors and his team announced a quality wave in the lagoon’s main break. “For experts seeking high performance conditions, the main break will provide 2 waves every minute, approximately 6 feet in height, that peel in unison in a perfect, cylindrical motion until they reach a close-out section, ideal for practicing explosive maneuvers,” they announced in a press release. Those waves, they claim, will offer rides more than half a minute long. My legs are burning just thinking about that kind of ride. Head high, with an even enough tempo and speed to throw turn after turn after turn. That’s like doubling the length of a ride at First Point Malibu without (hopefully) having to scream and yell and hustle your way through each section, letting all three thousand floating heads on the inside know you’re coming, dodging and weaving your way to the pier only to finish it all in some grandiose fashion. Oh, the claims. “Victoryyyyy”, in the immortal words of Johnny Drama himself. And that’s when I realize this is the detail, the feature that will make inland surfing an accomplished endeavor. Aside from the main lagoon designed for advanced, high performance surfing, waves up to 4 feet will be on hand for other surfers throughout the rest of the park. So now I think of all those little kids I had to dodge on the above First Point Malibu set wave. They sit on the inside section, picking off what they can. Some get waves and get better and better as they grow while for others it’s just another after school activity where they get to goof off with friends just a little bit longer. Either way, they’re not getting many waves and certainly aren’t getting the cream of the crop. A short closeout here, a small peeler there. Considering the average surfed wave is anywhere from a few seconds to ten seconds on a half decent day, the quality of those wave counts in Austin just offered a solid leap to the future of high-performance surfing. These kids are going to have the opportunity to put some real practice into their craft, at least the ones who legitimately fall in love with the sport. Athletes will grow out of the middle of America, essentially fulfilling a real life North Shore script. So we can spend the coming year arguing about the “experience” of surfing artificial waves having no comparison to dancing with the ocean herself, but so what? “Historically, surfing has been limited to those lucky enough to have access to the coastline”, says Josema Odriozola, Wavegarden’s Founder and CEO. And of that simple sentence, one word stands out the most to me about this project’s relevance in the grander scheme of our selfish pursuit of waves: lucky. It’s the perfect word to describe what separates the die hard salties and entitled standouts in lineups up and down the coast. We’re just flat out lucky to be where we are and do what we do. We throw tantrums and throw the stink eye far too often because we forget that fact. Now, somebody’s just simply giving that opportunity to people formerly faced with a 3 hour drive to the coast. And in the meantime, while all the Austin locals and tourists from Oklahoma need a few years of wave time to catch up to the rest of us I’ll happily take my road trip to Austin for a spot in the lineup of that main lagoon. 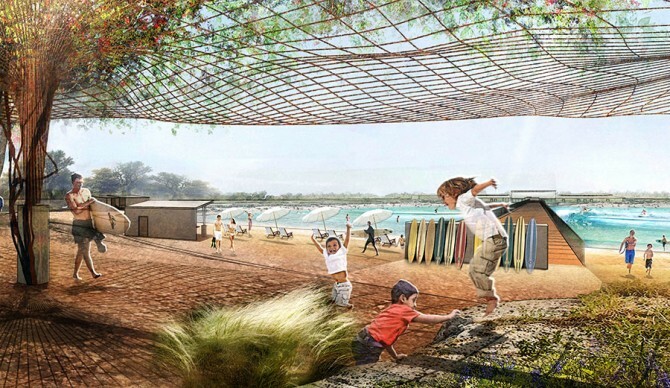 Austin Texas just became a surfing destination. 2 head high waves a minute. We all drive and fly far longer for less. So sign me up.